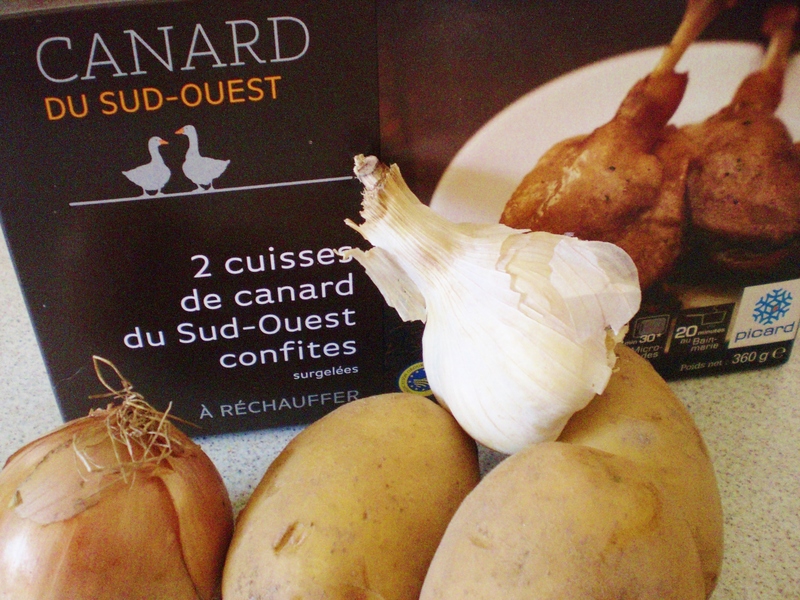 A thing one should absolutely always have in the storeroom is a tin, or several tins, of confit de canard. Legs and thighs of duck, preserved in their fat, have become much more common in recent years, and much less expensive. You can use them in a dish of cassoulet (haricot beans, duck and pork, shall I give you the recipe here some time soon? 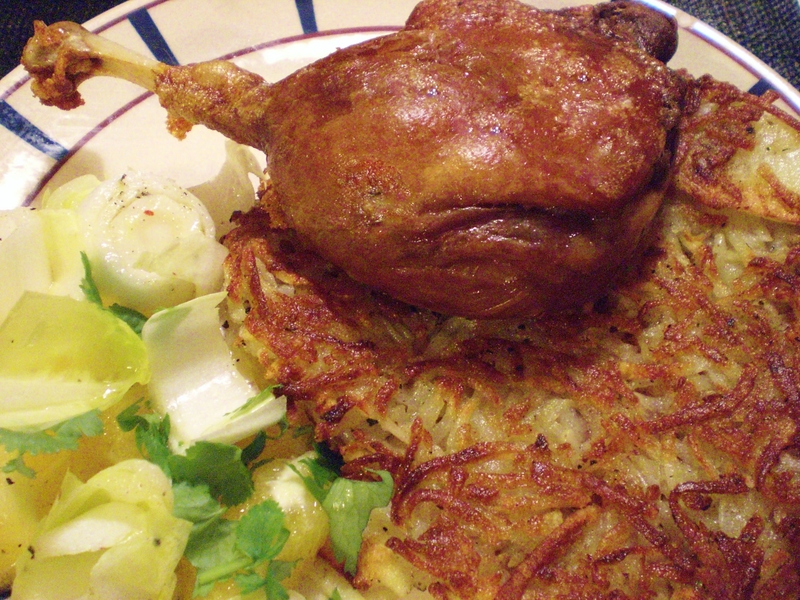 ), fried into crispy morsels on top of a salad (recipe here), or just heated in the oven and accompanied by chips, sliced sautéed potatoes (pommes sarladaises = potatoes the way they eat them in Sarlat), or, as in my recipe, pommes paillasson, which is the French name for the better known Swiss rösti. This consists of grated potato fried in a thick pancake until it is crisp on the outside and melting on the inside. This is the very classiest fast food to serve to guests who turn up unannounced forty-five minutes before supper time, and a morale boosting dish when you are feeling low. With a lovingly prepared green salad, and some ice-cream served with the alcoholic raisins I mentioned in last week’s post, you will have rustled up a meal fit for kings in half an hour or so. from the word une paille = a straw, which also gives us une paillasse = a straw bed (une paillasse is also said of someone who is weak and gets walked over; and sometimes also, but not very usually, the draining board of a sink). Une paille is also a drinking straw; and a colour – jaune paille = straw coloured, literally straw yellow. Etre sur la paille (literally to be on the straw) = to be broke, to have no money. Paillasson in my recipe refers to the texture and colour of the potato pancake, which is strawlike. Where it is evident that we are not talking about a dessert, potatoes (pommes de terre, literally apples of the earth) can be simply called pommes (which also means apples). 2 preserved duck legs and thighs, (I buy mine individually frozen, but they are more usually found tinned), with most of the fat removed. Keep this fat for roasting potatoes, or frying vegetables for soup. Place the pieces of duck on a non-stick baking sheet, or on an oven tray covered in grease-proof paper (be careful of aluminium foil, they tend to stick; actually they tend to stick anyway!). Place in the oven when it comes up to temperature, 20-25 minutes if tinned, even if cooked from frozen. Peel and grate the potatoes. Place in a sieve, squeeze with your hands to remove a maximum of moisture. You can them pat gently between several layers of kitchen roll to remove still more moisture. 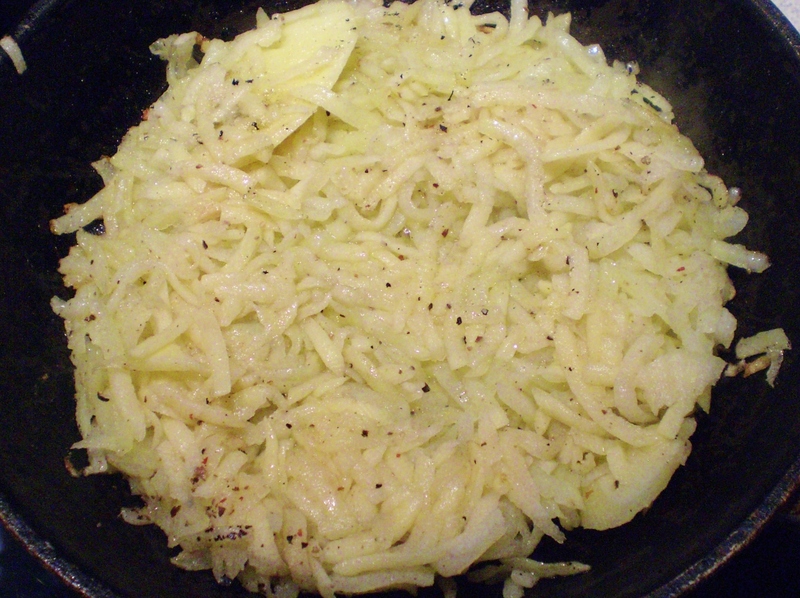 Add 1/4 level tsp salt per potato used, and several grinds of fresh black pepper. Mix thoroughly. If you are going to add onion or garlic and/or bacon bits, fry these up and mix with the raw potato. I personally prefer my pomme paillasson “nature”, that is, without added trimmings. Heat a tbs of oil (I used olive) with a small knob of butter in a frying pan, when it sizzles, scrape the potato into the pan and flatten it out with a spatula (choose a size of pan which will allow you to flatten the potato to a thickness of about 1cm or just a little more, so that it reaches the sides of the pan). Press it down, work a fork around it so that it is perfectly formed. It should not be thin around the edges. Turn the heat down to medium. The potato should brown nicely on the outside but soft in the middle. If you fry it too briskly, it will burn without properly cooking on the inside. 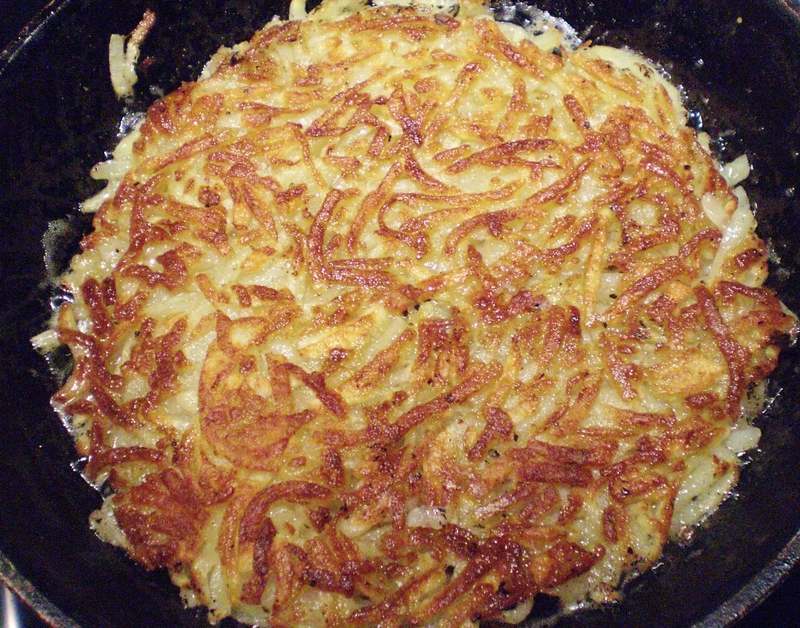 When you are ready to turn the potato cake, after about 4-5 minutes, run a palette knife under the potato to loosen, place a plate over the frying pan and turn the plate and the frying pan simultaneously. 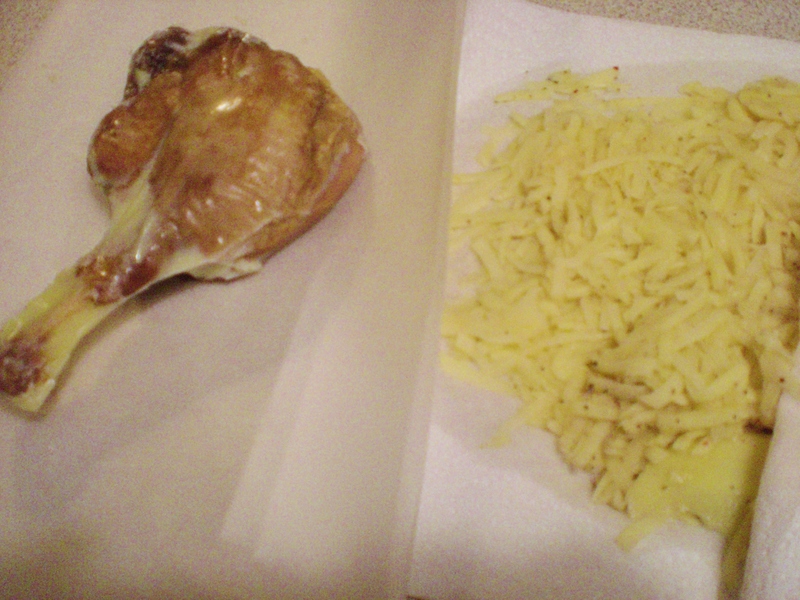 On the plate, the fried side of the potato will be on top. Put another tbs oil and a little butter into the pan, heat well, and slip the potato from the plate back into the pan, without breaking it, press down, bring the sides in a little to make it regular. Turn the heat down slightly again, and fry until the underside is uniformly golden. About another 5 minutes. When it is ready, slip it onto a clean plate, sprinkle with salt and serve. 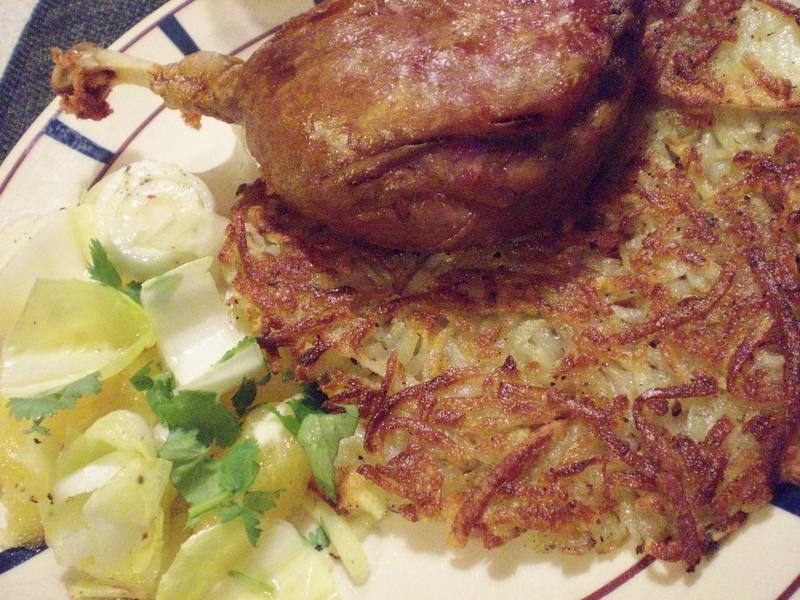 Take the duck out of the oven and serve onto warmed plates with a portion of potato cake. Serve with a salad : I did an endive (chicory I think it is in English, you can see from the photo below what I mean) and orange salad. Orange goes well with duck. Just slice an endive, peel and slice an orange, pouring the juice over the salad, add some parsley or coriander and a little walnut oil, salt and pepper. It needs no vinegar because of the orange juice. Both the duck and the potato should be really crispy. Nothing worse than confit which has not been crisped up properly. And the potato should be melting in the middle. Doesn’t your mouth water just looking at the picture? Posted in French recipes, Main courses, Masculine Nouns, Nouns and tagged confit de canard, Cook, crispy, Duck, France, French food, French recipes, French words, fried, Pancake, pommes paillasson, Potato, pronounce, rösti. Bookmark the permalink.